Fellow reviewer EscapeRouteBritish said of the group name, "Oh, I get it. It's a pun. Twoloud, kind of like 'Too Loud'." And that's pretty much what it is. Yet contrary to their name, this EDM trio from Germany has been quietly pumping out release after release. They had 10 releases in 2016; I only knew about one of them. They're silently prolific. But let's go back a couple of years earlier: 2014, shortly after Twoloud was just starting out as a project. One on their first tunes was the multifaceted "I'm Alive". The package available on Beatport only includes the Original Mix, so that's what we're rolling with. This only slowly sneaks in with some banjo-style pluckings before shuffling into the main event, the warped and pitched vocals of someone singing "I'm alive" alongside various other some other funky stutterings and choppings. The bread and butter, supposedly, comes from the harder electro-house poundings afterward. The monotone bassline doesn't help, giving this a more generic B-part. 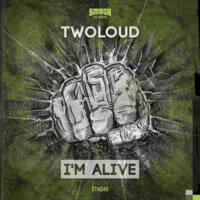 Twoloud tries switching it up by changing the instruments and adding some in-your-face trance synths for variety — a move that works, for the short period when it's in — but eventually they revert back to the more bland part. It might "rip up" a dancefloor, but in any other situation, it's an impressively below average hook. Aside from the vocal melody, which could be the track's saving grace, I grew tired of listening to this song from the first playthrough. Though the energy is strong in this song, it doesn't do anything aside from trying to be a part of the crowd with some of the most generic sound you'll possibly muster out of the EDM genre. I'm alive? More like I'm done.